Visiting the Alpenrose Restaurant ​​is a great way to start enjoying gastronomic features of Zurich. 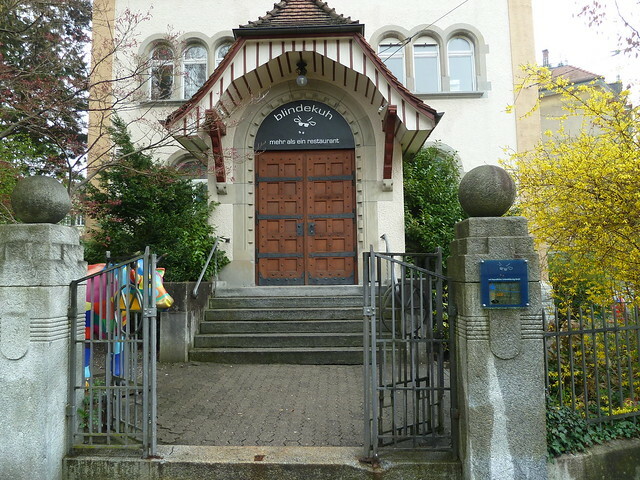 In this small establishment, which is elegantly decorated in Art Nouveau style, the menu is updated monthly and includes delicious cuisine from various cantons of the country. Sitting at a beautiful wooden table, you can taste there everything from ‘kapuns’ – dumplings made of beets with delicious fillings to common chopped veal. Average prices: ‘raclette’ – 27-38 CHF, fondue – 28-38 СHF, snacks – 10-18 СHF, first courses 35-60 CHF. 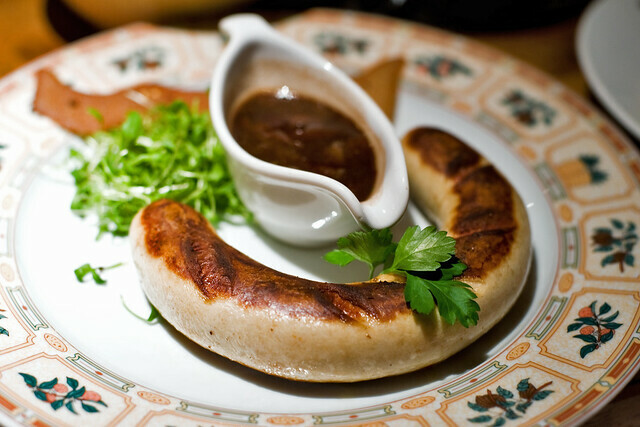 Kronenhalle Restaurant is a place where Swiss traditions and sophistication are combined in iconic local dishes. With an incredible art collection of paintings by Picasso, Varlin, Matisse, Miro and Chagall, the interior of the restaurant fully corresponds to its elegant menu. In addition to an extensive selection of Swiss dishes and an excellent wine list, Kronenhalle is famous for the most delicious chocolate mousse in Zurich. Average prices: snacks – 26-36 CHF, first courses – 45-65 CHF, wine – from 60 CHF per bottle. 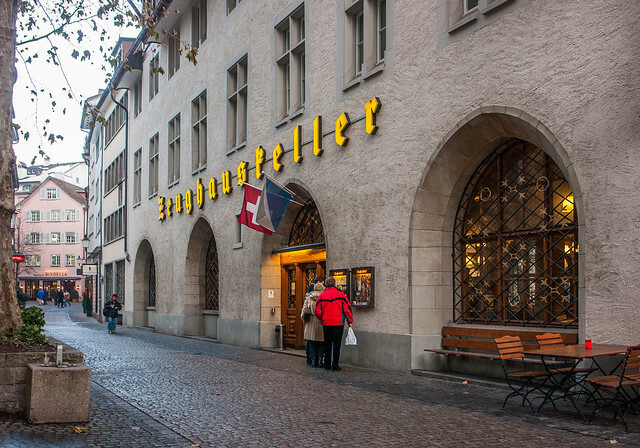 Zeughauskeller is a traditional restaurant of Zurich with a great history. Built in 1487, it’s still popular both among locals and tourists. It’s very convenient that its menu is presented in eight languages. The restaurant mainly specializes in beer (a wide selection of draft beers) and sausages (all kinds, including huge 1-meter-long one!). It’s impossible to order there fondue or ‘raclette’, however, delicious baked pork leg with ‘rosti’ and other meat dishes are available at very reasonable prices. The restaurant features a large hall, decorated with ancient weapons and knightly armor. So, Zeughauskeller won’t be a good choice for a romantic date. By the way, with ZurichCard you’ll get a free drink for lunch or dinner. Taking into consideration a great popularity of the restaurant, it’s better to book a table in advance. Average prices: salads – from 9 CHF, soups – 7-11 CHF, cold dishes – 15-20 CHF, first courses 17-27 CHF, beer – 5.80-6.20 CHF, wine – from 4.7 CHF/dl. Traditional recipes of Adler family – ‘Fondue Adler’ and crispy ‘rosti’ are always incredibly delicious. Swiss Chuchi offers authentic Swiss cuisine for real connoisseurs. Cozy atmosphere and high quality service are also included. The restaurant differs in a wide choice of fondue and ‘raclette’. You can taste the meat fondue. The restaurant is very popular, so you should either book a table in advance, or come there at least at 6pm – then you’ll have a chance to find a table for a couple of hours. Average prices: snacks 8-22 CHF, vegetarian dishes – 19-32CHF, meat dishes – 24-42 CHF, ‘raclette’ 25-37 CHF, fondue – 26-43 CHF, wine – from 42 CHF per bottle. Blindekuh Restaurant is a separate local attraction of Zurich. This unique restaurant was the first in the world where visitors enjoyed the food in total darkness, and their blind waiters served them. It’s believed that in the dark you will concentrate on the taste sensations much better and as a result, fully enjoy the delicious dishes. A small variety of choices is compensated by the amazing quality of the dishes. Despite a great popularity of Blindekuh, the prices in the restaurant are moderate enough, and you’ll need about 150 CHF for dinner for two persons with wine and snacks. Of course, the table must be booked in advance. Average prices: snacks 10-18 CHF, first courses 45-70 CHF, wine – from 45 CHF per bottle. Chasalp is a cozy Swiss restaurant located at the top of Zurichberg Mountain peak. The restaurant is entirely decorated with wooden elements creating a very relaxed atmosphere of Switzerland. If the weather is good, you can enjoy your food sitting in a spacious garden. The menu is dedicated to cheese dishes and offers a huge selection of fondue and macaroni. 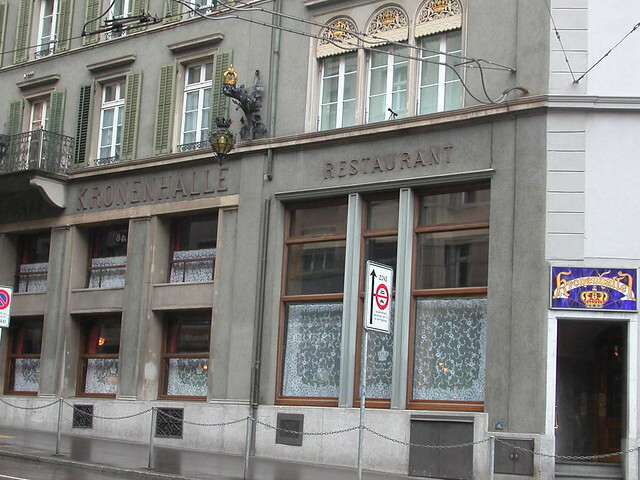 The restaurants of Zurich are very diverse. Many of them offer dishes of German, Italian, American, Thai, and even Japanese cuisines. However, you should definitely visit any establishment specializing in Swiss cuisine. Zurich is full of such restaurants, and the best of them are in this list. You can check out the address of the desired restaurant, and then easily find it by using Zurich rental car with GPS Navigator.